‘Knowing how to fold fitted sheets changed my life.’ A not so surprising statement from my traveller daughter on her return from three years in North America. Always organised and house proud, we often joked Anne’s cleaning frenzies bordered on OCD. I stared at the sheets and returned to my 1950s Scottish childhood. Mum, bringing in the washing from the back green and airing it on the pulley suspended from the kitchen ceiling. ‘Can I help fold the sheets, Mum?’ I said, the ever-eager helper. I’d have put a doll on the sheet to bounce up and down before being tipped out as we folded the sheet over. This was a common game for adults to play, bouncing a baby or toddler in a blanket. Older siblings amused each other by bouncing younger ones and with peals of laughter and squeals everyone anticipated that last bounce and the tipping onto a bed, mattress or soft grass. Working class improvisation of a trampoline, I suppose! I played shoogly shaggly with my girls as well and taught them how to make beds with hospital corners – a skill passed on from my ex-nurse mother. A well-made bed important not just for appearances, but comfort. I remember the heavy clunk, as the iron connected with our rickety wooden-framed ironing board. The old-fashioned instrument of my childhood, heavy and cumbersome to use. I remember too, the many burns I received from the iron’s hot silver sides while learning how to iron what seemed to be an endless pile of washing produced by our family of eight. One particular evening sticks in my mind when my sister Catriona and I shared the weekly ironing pile and counted 64 shirts and blouses! This was the era when gender roles were very clearly defined, most garments were made of cotton, and starched and pressed clothes standard attire. Depending on the items and the quantity to be ironed, the ironing board remained folded against the wall of the dinette and the thickness of an old blanket on the Formica kitchen table sufficed. This at least softened the noise and provided a wider surface than the ironing board, circa 1900, inherited from Dad’s mother. Mum taught me the necessary skill for domesticity by letting me practice on handkerchiefs, serviettes, pillowcases and tray cloths. 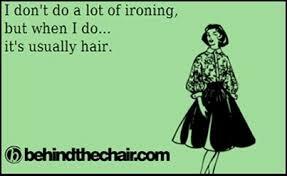 Uncomplicated ironing. However, like Erma Bombeck, I avoid the task of ironing now and shake my head in disbelief at memories of begging Mum to ‘let me help’. Dorothy Law Nolte, PhD said children learn what they live and I suppose my introduction and desire to learn household chores such as ironing, emulated Mum. 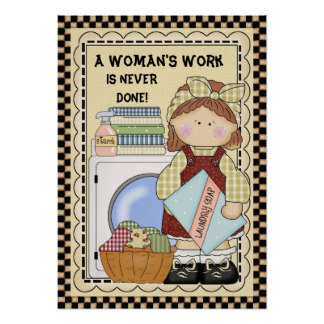 Born in 1953, even if my parents wanted more for me than to be a housewife, the message society broadcast on every level, said girls had to be good at housework. We were baby machines, supportive wives and proud housewives, and should know our place. This message reinforced when I joined the Brownies, and later Girl Guides, although they also encouraged independence, ingenuity and imagination. My keenness to iron well and progress to more complex items, a necessity, and duly rewarded by various cloth badges to sew on my uniform. I could proudly declare I was a good helper around the house. 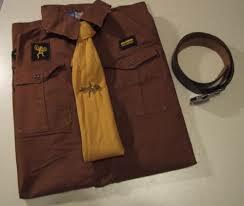 Every week I’d polish my shoes and leather belt, don my brown uniform, brown beret and yellow tie and go to the local community hall to be with the other Pixies in my Brownie pack. From memory I think one badge, the Busy Bee sported a bright yellow bumblebee. The Thrift badge an easy one to achieve in our working class home because with limited money and many mouths to feed, thriftiness became our family motto. While the boy scouts wandered the neighbourhood fundraising for ‘Bob a Job’ and chopping wood, weeding or carrying shopping, we were firmly indoctrinated for our role as future wives and mothers. I made something new out of something old by cutting up an old towelling nappy to make a face-washer and sewed blanket stitch to decorate its new hems. I helped Mum set a fire in the grate, clean out the ashes and fill the coal scuttle. The Homemakers and Laundry Badge involved, cleaning and dusting, setting the table, washing dishes and keeping my shared bedroom tidy (a bone of contention because I shared a bedroom for years). The white picket fence boundaries of the ‘50s well and truly delineated. 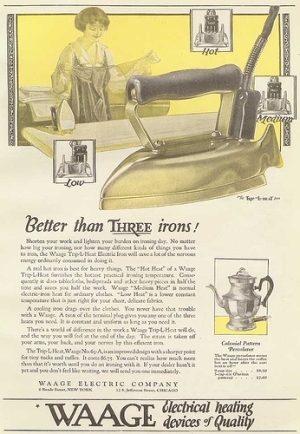 Mum used an electric iron, a far cry from the old pre World War Two flat irons, which had to be heated on the kitchen range. However, the first electric irons had no thermostat, and you tested its heat in the time-honoured way of licking your finger and dabbing the plate, or spitting lightly. The temperature judged from the sizzling of skin or spittle. The absence of steam irons or iron that squirted water a burden because most clothes were made of cotton or linen and had to be ironed damp for the best result. Drip dry synthetics became popular after the war, made of fabric that did not wrinkle when hung dripping wet to dry to avoid ironing, but in a climate like Scotland, they took a long time to dry and who wanted clothes dripping from the pulley? Early nylon clothes washed and dried with minimum wrinkles could melt if the iron too hot. Mum often removed the clothes from the line before they were quite dry to make the pressing easier. When we came to live in Australia, Mum took paid work in Johnson Bros. Pottery, to help save and build our own home. The washing and ironing became a shared chore, particularly when Mum worked regular overtime and Saturday morning shifts. On many occasions clothes missed the washing cycle and had to be ironed dry if we wanted to wear them to a particular function. Steam rising from clothes straight from the washing machine, a never to be forgotten smell. If stains from the iron or ironing board cover ruined the item, the curses colouring the air blue not forgotten either. Clothes were scorched when the iron over heated, and trousers and skirts developed an unacceptable shine if a damp pressing cloth forgotten (one of Dad’s large handkerchiefs our regular pressing cloth). In my teenage years, hands and arms bore scars from sears and burns. Reminders of carelessness, lapsed concentration, being too particular, or lacking skill and strength to manipulate the iron around intricate cuffs, collars, folds and pleats. The smell of pressed wool and linen and damp serge still lingers in nostrils, and years later I wonder if the wear and tear in my shoulder joints date back to the heavy repetitive nature of household tasks such as ironing. Teenage years in the 70s even saw us iron our long hair – no fancy hair straighteners in those days just the revolting smell of singed hair. The second hand Hoover washing machine we inherited in Australia was a tiny single tub with a broken spin dryer. It sat on the concrete floor of an unlined, tinned roof, weatherboard outhouse fitted out as a laundry – our very own Turkish bathhouse in summer and Siberian prison in winter. We hooked the clothes from the washing machine and placed them in two huge concrete laundry sinks filled with cold water for rinsing and fed them through a mangle attached to the side of the sink. The old fashioned mangles squeezed a lot of the moisture from the clothes reducing the weight and unpleasantness of hanging washing out dripping wet, although some items had to be fed through the hard rubber rollers a couple of times. The electric mangle fascinated ten year old me and in the excitement of feeding clothes through faster to spend more time playing with friends, I often tangled the clothes into bunches, and jammed the machine. On rare occasions, trying to be too smart or fast, I fed sheets through before removing my hand from their folds. Luckily, the off switch easily reached by connections installed by Uncle Bill McKendrick, a first class electrician. The bruises and pain not so quickly fixed, or my injured pride from the harsh lecture I’d receive from Mum. I hated letting her down by appearing incompetent, aware she felt guilty at not keeping abreast of household chores. Mum and Dad worked incredibly long hours chasing money to pay the rent, put food on the table, and clothe and educate us. Australia is a paradise for laundering clothes compared to Scotland where inclement weather makes drying clothes outside difficult. I remember washing hanging from the pulley suspended from the kitchen ceiling, or hung over wooden maidens (clothes horses) placed in front of the living room fire. Steam rising as if the clothes were smoking, a common sight in winter. The clothes dried inside always smelled of coal, if dried in the living room, or of the variety of food cooked, when dried in the kitchen. Pulleys were fixed to the ceiling and lowered by a rope which would be then tied to a hook on the wall to keep it level until loaded with washing. When full, the pulley would be hoisted to near the ceiling. It could hold a lot of washing and Mum used it to air the clothes this way too, even in summer. Depending on what was on the menu, she’d take them down before cooking because the smell of fish could linger for days on clothes. 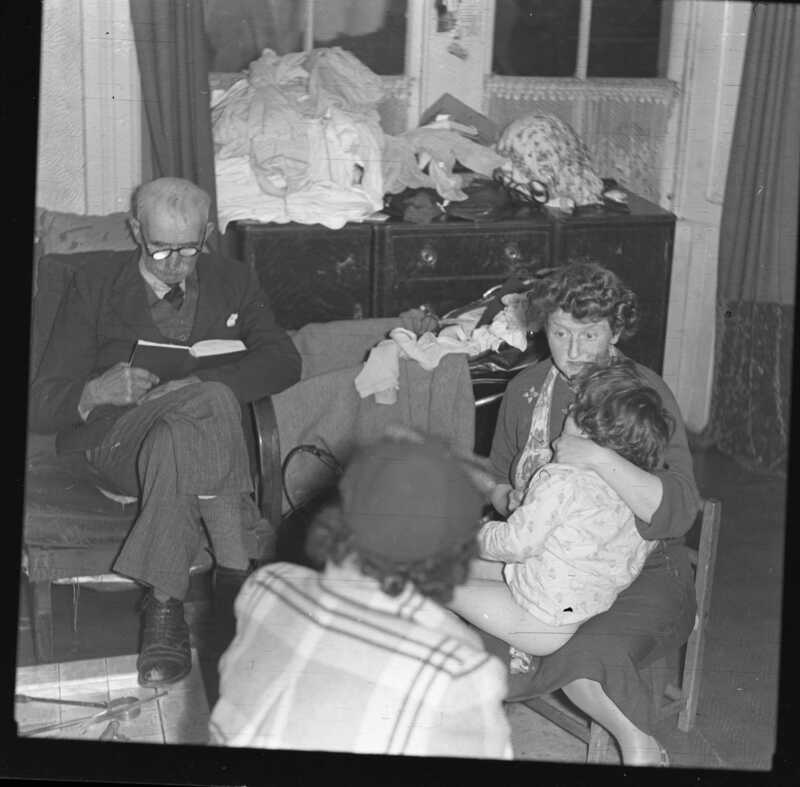 In the winter, Mum always had a coal fire burning in the living room with the rest of the house unheated unless we were flush with money and could feed the gas heater to heat water piped to upstair rooms with wall radiators. Most working class homes made decisions about heating depending on their budget. My Dad being a railwayman, always had work and took every piece of overtime offered so the coalman topped our bunker up at regular intervals, but even we would have struggled to feed more than one fireplace in winter. Several neighbours whose husbands worked in the shipyards where work was seasonal and either boom or bust – often ran out of coal . They’d ask Mum if they could borrow a bucket of coal until payday and Mum never refused. There were households where the breadwinner drank heavily or the woman at home had poor or non-existent housekeeping skills. These families suffered all year, especially the Jepson family who lived across the road from us. Not only were they constantly in debt and having to borrow food and fuel, but when the Council inspector did his annual rounds, Mrs Jepson asked to borrow our kitchen cupboard doors because they had burnt theirs when they ran out of coal. Sometimes damp washing hung on the fireguard, if more drying space was needed. Mum kept an eye on these clothes. A roaring fire generated a lot of heat and a gust of wind down the chimney could send flames awry. Drying washing could be scorched or even set alight. We were alerted to the danger of fire at an early age. Our neighbours, ‘through the wall’ as Scottish vernacular referred to the close proximity of those who lived in semi-detached council houses, were Kathy and Jimmy Johnson. They had a daughter Maureen, a few years older than my sister Catriona. We had not long moved to the house in Davaar Road when Mum witnessed a tragic incident she never forgot. Teenager Maureen received a present of a nightie made out of nylon and lace, synthetic materials grown in popularity since the war. She was brushing her hair in front of the mirror hanging above the mantlepiece when flames flared and licked at her nightie. In seconds, her clothes were aflame, melting and sticking to her body. Her long hair caught alight. Maureen’s screams seared into Mum’s memory, as was the sight of the teenager running outside and throwing herself onto the ground. Adrenalin kicked in, Mum, scaled the side fence like an Olympian, ordered Kathy to grab the rug from the hallway and throw it over Maureen. Between them they got the fire out. Mum called an ambulance. Luckily, for the Johnsons, we were one of only two families in the street with a telephone connected. If ever we ventured too close to the fire or complained about not being hot enough, Mum reminded us of Maureen. She also made sure no matter what house we lived in there was never a mirror above the fireplace. My younger sister, Rita confesses to enjoying ironing – it’s her thinking time she says and I’m sure other people feel the same. Meanwhile my aversion has continued to grow. Perhaps, Catriona and I had too much ‘thinking time’. Ironically, when John and I struggled to pay the mortgage in 1990, a time when our then Prime Minister, Paul Keating said, ‘… this is the recession that Australia had to have,’ I regularly ironed a mountain of shirts, but this time I was paid by the people who dropped their ironing off and I was grateful! Nowadays, I check the labels of all clothes –– if there’s special washing or ironing instructions, I don’t buy. Life is too short and there are a lot more pressing (and enjoyable) matters to take up my time!